Does Your Child Tend to Wander? New Wearable Child ID Gives Parents a Peace of Mind! Protect your kids the smart way and get reunited with your lost child fast! SAN DIEGO - June 17, 2014 - PRLog -- Either a child gets lost in a public place or needs special treatment in case of a medical emergency - it's a parents' worst fear not being able to protect a child in a situation like this! Liv & Leo, Inc. created an "easy to use" solution that reconnects a lost child with the parents fast and provides a helper with any possibly lifesaving medical information as quickly as possible - it is called SmartKidsID! Products come pre-engraved with a unique QR Code that can be linked to a fully customizable secure and password protected child ID online profile. They include fun colored ID bracelets and shoe ID tags that are waterproof and tested for the use by children. Products are affordable and there is no membership or any other fee associated. SmartKidsID is available at http://www.SmartKidsID.com/Shop and on Amazon. SmartKidsID is the perfect solution for kids with a medical condition or when visiting crowded places like the mall, water parks, amusement parks, theme parks or when travelling! Creating a child Id and activating a new QR Code just takes a few steps with the new SmartKidsID App that is available in the App Store. It an be done right on the go! This video gives a short overview on how SmartKidsID works: https://www.youtube.com/watch?v=4XU-V_5PmtM. 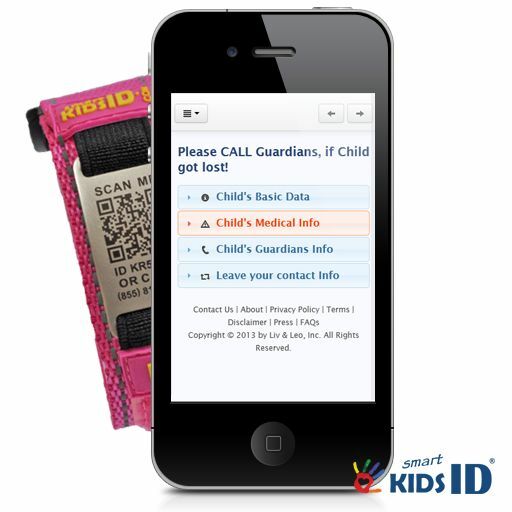 Codes can be scanned with the new SmartKidsID App or any other free QR Scanner in the App Store! To insure that a child's Id information is protected, a helper can just access information the parents decided to make public! And SmartKidsID can do more! When a child goes missing and parents have to contact local law enforcement agencies parents send a "Missing Child Alert" directly from the account with all of the child's information plus additional information that could be helpful to locate a child as quickly as possible. If this can make a difference in one child's life it is worth the incremental cost! Protect your kids the smart way! San Diego, CA based SmartKidsID is owned by Liv & Leo, Inc. a company founded by a mom of three out of the need to provide cost efficient solutions that improve child safety and first responders reaction time. : SmartKidsID powered by Liv & Leo, Inc.